Coleraine racked up another four goals without conceding as they moved level on points with Linfield following Saturday’s win at Warrenpoint. The Bannsiders blew the basements boys aside and were only unlucky not to have added more goals to their total. James McLaughlin added another goal to his tally, with Ian Parkhill helping himself to a brace either side of a strike from Darren McCauley. 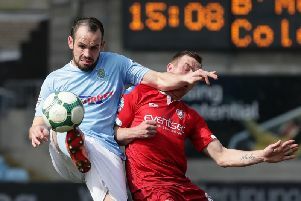 The result coupled with Linfield’s defeat at home to Cliftonville moved Oran Kearney’s side level on points with the Blues. The Bannsiders’ boss is refusing to get carried away though. “Big pictures, league tables, all that sort of stuff, honestly it’s not even in the psyche at this point in time,” Kearney told Times Sport after the game. The visitors took the lead with the first opportunity of the match after just three minutes of play when McLaughlin took his tally to 12 for the season with a clever finish. The Bannsiders then doubled their lead two minutes later with another well-worked goal that originated down their right hand side. Jamie McGonigle tucked the ball back inside for the onrushing Parkhill to fire home past Shanahan at the near post from ten yards. It took just seven minutes of the second half for Coleraine to go three in front as the rain began to lash down at Milltown. Parkhill’s cross was helped on by McLaughlin and McCauley, who scored a hat-trick last week against Portadown, finished to make it 3-0 to the away side. Parkhill then made it four with 13 minutes remaining with a sensational run and finish down the right to put the icing on the cake for Kearney’s side. “The way this season has gone and this last month in particular has been brilliant,” he added. “The other side of it is that this isn’t an easy place to come and I said that to the lads beforehand. I think it took Linfield until 60 minutes to get a goal here and they’re good at home, Warrenpoint. “But where we’re at, at this point in time, we knew that if we turned up today we could come and do some damage. “To get the early goal as brilliant and to get another one just before half-time having missed a few chances; I would have been critical at half-time if we had only gone in 1-0 up. “The second one gave us the cushion and then the third early in the second half, there’s never a bad time to score a goal, but I think the timing of our goals were probably very sore on Warrenpoint. “Darren has played up front in his career, Ian Parkhill is a striker as such but he plays right midfield and we have a lot of players on the pitch who have the ability to score goals. “Up until the last few games we had been relying heavily on James and our strikers and it’s nice now that we’re starting to weigh in from different areas of the pitch. “It was a great strike. I think James’ strike as well, the ball was played in behind him and it was a great finish. “Jamie played a nice ball into Ian for his first and then Ian’s second will be the standout one and the one that will be remembered,” added the Bannsiders boss.